Having just completed a historic, weeklong series of events in Croatia for ULTRA Europe, the world’s most international festival brand, ULTRA Worldwide, now reveals the first batch of heavy hitters set to perform at the inaugural edition of Road To ULTRA Singapore! 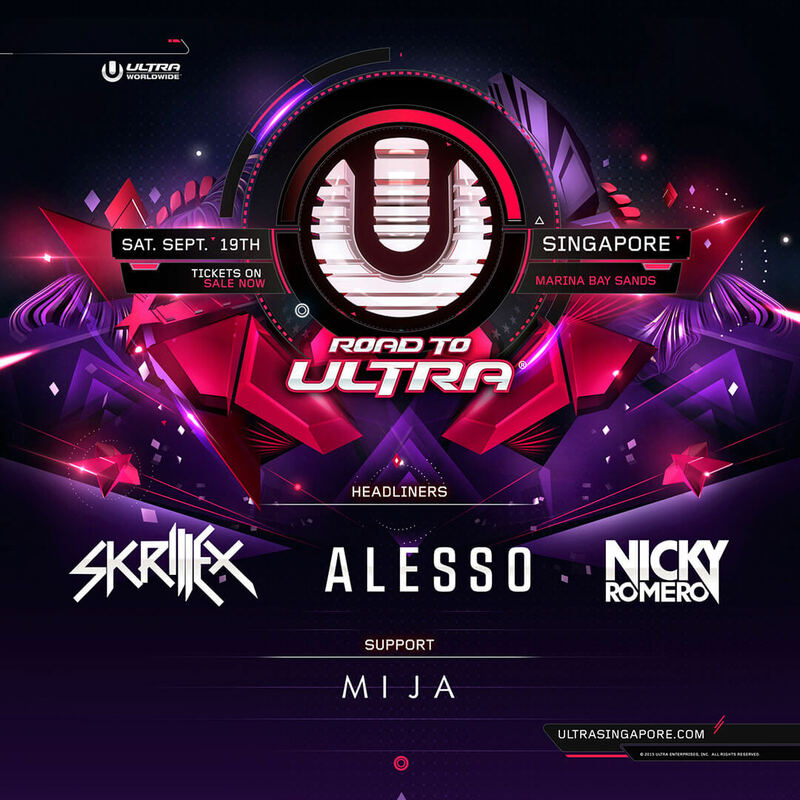 Gearing up to transform the iconic Marina Bay Sands Convention Centre on September 19, Road To Ultra Singapore will be welcoming some of the hottest acts on the planet as Skrillex, Alesso, Nicky Romero and Mija make up the first group of megastars to join the bill in a huge Phase One lineup announcement. Firm ULTRA favorites Skrillex, Alesso and Nicky Romero will be showcasing their juggernaut performances to the Marina Bay for the first time, while Mija will be making her debut ULTRA performance, bringing her jacking bass-heavy sound to the attention of the Southeast Asian Island. Internationally celebrated for gathering the world’s hottest talents together under one roof, ULTRA Worldwide will be extending this reputation to Singapore later this year, complete with cutting edge stage production, world class visuals and the highest quality sound. Fans from across Singapore and beyond can look forward to experiencing the same level of world-class production and the unique ‘ULTRA experience’ found at any of ULTRA Worldwide’s international events. Perfectly coinciding with Singapore’s legendary Formula 1 weekend, over 10,000 fans are expected to descend upon the idyllic bay front location to witness the hottest acts in electronic music, for what will be a truly unforgettable occasion. ULTRA WORLDWIDE, producers of the award-winning ULTRA MUSIC FESTIVAL in Miami, launched a new event concept early in 2012 appropriately named, ‘ROAD TO ULTRA.’ Since then, RTU’s have landed in THAILAND, KOREA, JAPAN, TAIWAN, MACAU, COLOMBIA and PARAGUAY with more confirmed for 2015 in PARAGUAY (2nd edition), TAIWAN (2nd edition), BOLIVIA, PERU, SINGAPORE and THE PHILIPPINES. Road to ULTRA events are single-stage events with the same focus as the ULTRA Worldwide festivals. Each event showcases cutting-edge stage production including world-class visuals, lighting, kryogenics and pyrotechnics. Stage designs are developed by the ULTRA Music Festival creative team and adapted to accommodate the needs of both indoor and outdoor venues. Just as the ULTRA festivals boast the world’s hottest talent, Road To ULTRA features the top electronic music artists in today’s electronic music scene. Artists such as Tiesto, Hardwell Martin Garrix, Alesso, Steve Angello, Above & Beyond, Afrojack, Fedde Le Grand, Porter Robinson and more have already headlined previous RTU’s, bringing tens of thousands of fans to these events. ULTRA Worldwide is already the most international electronic music festival brand by far (with festivals on five continents including AFRICA, SOUTH AMERICA, EUROPE, ASIA and NORTH AMERICA), but with the addition of the Road to ULTRA concept, ULTRA has truly raised the bar. The RTU events continue to drive ULTRA apart from the competition by offering one-of-a-kind experiences to electronic music fans in even more regions around the world. ULTRA WORLDWIDE is the global edition of the World’s Premier Electronic Music event, ULTRA MUSIC FESTIVAL. The ULTRA brand was founded in 1997 by Executive Producer, President & CEO Russell Faibisch, and began producing electronic music events in South Florida, which led to the inaugural Ultra Music Festival in 1999 on the sands of Miami Beach. The internationally renowned festival, which has taken place every March since its inception, celebrated its seventeenth anniversary from March 27-29, 2015 by bringing over 165,000 music enthusiasts to the sold out waterfront event in the heart of the City of Miami. Ultra Music Festival returns to Bayfront Park for its eighteenth annual edition, 18-20 March 2016. Choosing to follow a unique, creative vision and a wholly organic growth focused around a true love for music, artists, and fans alike, the ULTRA and ULTRA Worldwide brands represent not only the world’s biggest and most successful remaining INDEPENDENT electronic music festival brand, they are now the most international of any festival brand in the world by far. The event organizers continue to transport the unrivaled experience from the Miami flagship festival to an ever-growing number of destinations and fans all over the globe. Over the past seventeen years, literally thousands of the world’s most iconic DJs, producers and live acts have mesmerized audiences with awe-inspiring sets at ULTRA festivals in ARGENTINA, BRAZIL, CHILE, CROATIA, IBIZA, JAPAN, KOREA, SOUTH AFRICA and of course MIAMI, as well as ROAD TO ULTRA events in CHILE, COLOMBIA, MACAU, PARAGUAY, SEOUL, TAIWAN, THAILAND, TOKYO, USA, and now forthcoming events in BOLIVIA, BRAZIL, SINGAPORE, THE PHILIPPINES as well as ULTRA BEACH – BALI. Each and every new global edition is founded on the same successful recipe that has been perfected over seventeen years in Miami, combining the most diverse electronic talent with the most technologically advanced, large-scale festival productions in the world. In addition, the ULTRA brands pioneered the live stream experience, ‘ULTRA LIVE’ (whereby the festival is brought online to over 20 million unique viewers globally) and the audio broadcasting platform ‘UMF RADIO’ (syndicated to FM Radio in over 42 countries and reaching more than 22 million listeners weekly). Also ‘UMF FILMS’ collaboration with FINALKID has seen some of the most visually breathtaking festival aftermovies in the music space, including a feature-length documentary exploring the latest explosion of dance music, entitled CAN U FEEL IT, which premiered at the Ultra Music Festival, Miami 2012 and was exhibited in over 500 theaters across the Unites States. In 2014, the ULTRA and ULTRA WORLDWIDE brands continued to push the boundaries, bringing an unparalleled combination of cutting edge production and the world’s best electronic acts back to previous strongholds and new frontiers across the globe. With its most recent new festival editions breaking records in JAPAN in September 2014, SOUTH AFRICA in February 2015 and KOREA in June 2015, and with the addition of the many new ROAD TO ULTRA events, the ULTRA brand has now united SIXTEEN COUNTRIES across FIVE CONTINENTS worldwide.